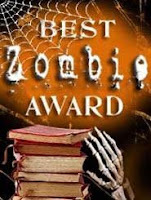 Bookbinding Etsy Street Team: The BEST Zombie Award goes to... PART 2! Along with Sara of RePaper.Etsy.com, Rhonda of MyHandboundBooks.Etsy.com has won the BEST Zombie Award 2009! Although it was a tie this year, Rhonda proved an exciting contender with her unique tunnel book, titled "Trapped Inside a Haunted House." Congratulations to Rhonda, who now gains all of the BEST Zombie Award graphics and bragging rights for a whole year! Rhonda explains that a tunnel book "consists of a series of 'pages' that create a scene when you look through the front." While it can be closed flat, it is really meant to be expanded and displayed. For her Halloween Tunnel Book, she cut out a spooky scene in black card stock and covered the front frame with a richly beautiful gold and black printed paper. This book is sure to pop ---get it?--- out at you! Be sure to check out Rhonda's shop on Etsy, My Handbound Books, where you can find all sorts of books, including gorgeous leather books in all colors and sizes!